These things might sound familiar by now. Zach Norvell Jr. going on a scoring spree. Brandon Clarke swatting everything in sight. Josh Perkins distributing. Gonzaga dominating inside. And, unfortunately, star-crossed forward Killian Tillie landing on the injury list again. One thing that is starting to sound more familiar as the season progresses: Gonzaga’s defense competing with its high-powered offense for headlines. The fourth-ranked Zags notched their 13th straight win with another solid all-around performance, but this one was more impressive in one sense: Gonzaga took apart San Francisco, a team considered to be on the NCAA Tournament bubble, 92-62 in front of 6,000 Thursday night at the McCarthey Athletic Center. The Dons (17-6, 5-4 WCC) entered with their best 22-game start since 1982. They’ve now only lost two games by more than six points; Gonzaga went on a late run to win the first meeting 96-83 last month. 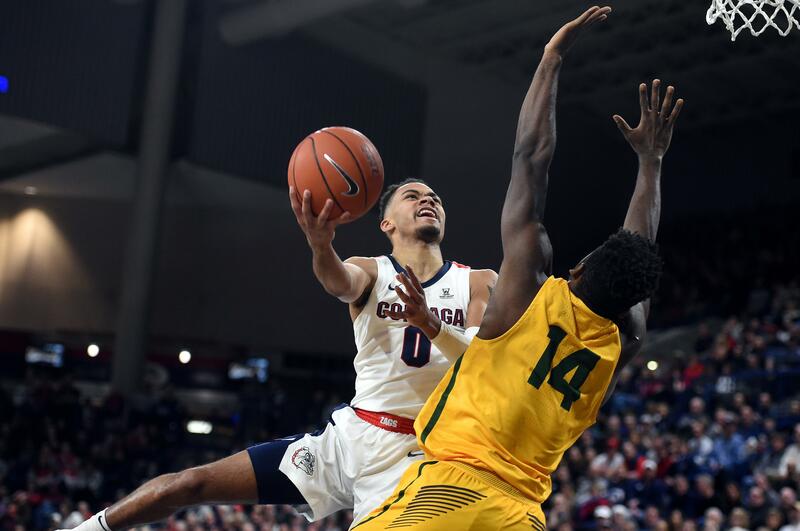 The Zags (22-2, 9-0) went on a 24-minute run to blow out USF in the rematch. Clarke added a game-high 16 rebounds. Norvell provided the spark late in the first half. The sophomore wing dropped a 3-pointer to boost GU’s lead to 31-25. He followed with two more 3s, a layup and a pair of free throws for a personal run of 13 points in roughly 3:20 as the Zags led 43-30 at half. Norvell’s lone second-half point came on a free throw after a hard foul by USF standout point guard Frankie Ferrari early in the second half. Tempers flared and both were assessed technicals, which hurt the Dons more because Ferrari spent part of the half on the bench with four fouls. Ferrari finished with 14 points, four steals and three assists, but the Zags generally kept the 5-foot-11 senior in check. Guard Charles Minlend scored 10 points in the opening half, but was limited to four points on 2-of-7 shooting in the second half. By game’s end, Ferrari probably saw six or seven defenders as the Zags switched often on screens, which put Clarke on the point guard at times. Ferrari had just three assists – he averages 5.7 – and two turnovers. Perkins joined in with one of Gonzaga’s 10 blocks. Tillie, who missed the first two months of the season following ankle surgery to repair a stress fracture, hobbled off the court and went immediately to the locker room after connecting on two field goals that put the Zags up 62-46. Tillie, who has played in just nine games, will have additional tests today. Gonzaga limited the Dons to 39 percent shooting and nearly 15 points less than their season average. After being outscored in the paint in the first half, the Zags pounded USF 30-16 in the final 20 minutes. The Zags had multiple scoring options, led by Clarke’s 20 points and Rui Hachimura’s hard-earned 17. Geno Crandall added 12 points, one shy of his season high. Norvell has hit 8 of 12 3-pointers in the past two games. Published: Feb. 7, 2019, 10:27 p.m. Updated: Feb. 7, 2019, 11:06 p.m.